Commercial window tinting in Brooklyn for offices, restaurants, and all business properties. Our window tint professionals possess years of experience providing commercial window tint in Brooklyn, NY. 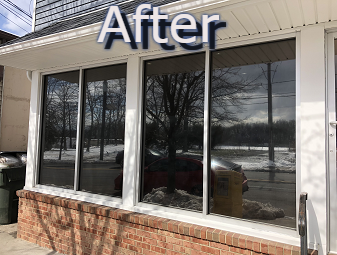 In addition to window tinting, we offer the following services for our business customers: frosted window film, security window film, commercial glass tinting, decorative privacy window film, and office window tinting. We are quite confident in our products and services. 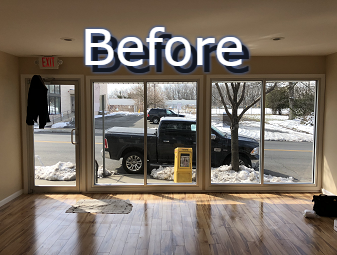 Our commercial tinting improves the appearance of your business property while bringing comfort to your employees, clients, and customers. Anti-Graffiti Protection​: security window film protects your business from graffiti and scratching. Proficiency: reducing the entry of solar energy, while retaining heat winter months. Security Window Films: providing a solid, optically transparent barrier film that adheres to the inside of your windows, strengthening glass and aiding to keeping it safely in place upon impact. Saving money with commercial window tinting is as simple as contacting our experts for glass tint installation service. We provide store front window tinting service to protect your school, church, restaurant, store, or any kind of business etc. From the possibly destructive effects of the sun and to keep you comfortable during Brooklyn, NY summers. Contact us, and we'll equip your commercial property with precision window tinting that gives you the protection you deserve.